The total increase between the average of the 1850–1900 period and the 2003–2012 period is 0.78 [0.72 to 0.85] °C, based on the single longest dataset available. These figures are all from the HADCRUT4 dataset. There are three areas to account for the difference of 0.09°C. Mostly it is the shorter baseline period. Also, the last three years have been influenced by a powerful and natural El-Nino, along with the IPCC using an average of the last 10 years. There are valid reasons for the authors differing from the IPCC’s methodology. They start with the emissions from 1870 (even though emissions estimates go back to 1850). Also, if there is no definite finish date, it is very difficult to calculate the warming impact to date. Consider first the full sentence quoted above. Average temperatures for the 2010s are currently 0.87°C above 1861–80, which would rise to 0.93°C should they remain at 2015 levels for the remainder of the decade. More than half of the observed increase in global mean surface temperature (GMST) from 1951 to 2010 is very likely due to the observed anthropogenic increase in greenhouse gas (GHG) concentrations. It was after 1950 when the rate largest increase in CO2 levels was experienced. From 1870 to 1950, CO2 levels rose from around 290ppm to 310ppm or 7%. From 1950 to 2010, CO2 levels rose from around 310ppm to 387ppm or 25%. Add in other GHG gases and there the human-caused warming should be 3-4 times greater in the later period than the earlier one, whereas the warming in the later period was just over twice the amount. Therefore if there is just over a 90% chance (very likely in IPCC speak) of over 50% of the warming post-1950 was human-caused, a statistical test relating to a period more than twice as long would have a lower human-caused element of the warming as being statistically significant. Even then, I view the greater than 50% statistic as being deeply flawed. Especially when post-2000, when the rate of rise in CO2 levels accelerated, whilst the rise in average temperatures dramatically slowed. There are two things that this suggests. First, the impact could be explained by rising GHG emissions being a minor element in temperature rise, with natural factors both causing some of the warming in the 1976-1998 period, then reversing, causing cooling, in the last few years. Second is that there is a darn funny lagged response of rising GHGs (especially CO2) to rises in temperature. That is the amount of warming in the pipeline has increased dramatically. If either idea has any traction then the implied warming to come of just 0.06°C is a false estimate. This needs to be elaborated. If a doubling of CO2 leads to 3.00°C of warming (the assumption of the IPCC in their emissions calculations), then a rise in CO2 levels from 290ppm to 398 ppm (1870 to 2014) eventually gives 1.37°C of warming. With other GHGs this figure should be around 1.80°C. Half that warming has actually occurred, and some of that is natural. So there is well over 1.0°C still to emerge. It is too late to talk about constraining warming to 1.5°C as the cause of that warming has already occurred. The equilibrium climate sensitivity quantifies the response of the climate system to constant radiative forcing on multicentury time scales. It is defined as the change in global mean surface temperature at equilibrium that is caused by a doubling of the atmospheric CO2 concentration. Equilibrium climate sensitivity is likely in the range 1.5°C to 4.5°C (high confidence), extremely unlikely less than 1°C (high confidence), and very unlikely greater than 6°C (medium confidence). The equilibrium climate sensitivity ECS is at the very bottom of the IPCC’s range and equilibrium climate response is reached in 5-6 years instead of mutlicentury time scales. This on top of the implied assumption that there is no net natural warming between 1870 and 2015. Apart from the policy objective in AR5 was to limit warming from 2°C, not 1.5°C, it also mentions the need to constrain GHG emissions, not CO2 emissions. Then slide 33 gives the simple policy simplified position to achieve 2°C of warming. To the end of 2011 1900 GTCO2e of GHGs was estimated to have been emitted, whilst the estimate is around 1000 GTCO2e could be emitted until the 2°C warming was reached. The is the highly simplified version. At the other end of the scale, AR5 WG3 Ch6 p431 has a very large table in a very small font to consider a lot of the policy options. It is reproduced below, though the resolution is much poorer than the original. The CO2 equivalent concentration in 2100 (ppm CO2eq ) is 430-480ppm. Cumulative CO2 emissions (GtCO2) from 2011 to 2100 is 630 to 1180. CO2 concentration in 2100 is 390-435ppm. Peak CO2 equivalent concentration is 465-530ppm. This is higher than the 2100 concentration and if for CO2 alone with ECS = 3 would eventually produce 2.0°C to 2.6°C of warming. The Probability of Exceeding 1.5 °C in 2100 is 49-86%. They had to squeeze really hard to say that 1.5°C was more than 50% likely. Compare the above to this from the abstract of Millar et. al 2017. If CO2 emissions are continuously adjusted over time to limit 2100 warming to 1.5◦C, with ambitious non-CO2 mitigation, net future cumulative CO2 emissions are unlikely to prove less than 250 GtC and unlikely greater than 540 GtC. Hence, limiting warming to 1.5◦C is not yet a geophysical impossibility, but is likely to require delivery on strengthened pledges for 2030 followed by challengingly deep and rapid mitigation. They use tonnes of carbon as the unit of measure as against CO2 equivalent. The conversion factor is 3.664, so cumulative CO2 emissions need to be 870-1010 GtCO2 range. As this is to the end of 2015, not 2011 as in the IPCC report, it will be different. Subtracting 150 from the IPCC reports figures would give a range of 480 to 1030. That is, Millar et. al 2017 have reduced the emissions range by 75% to the top end of the IPCC’s range. Given the IPCC considered a range of 1.5-1.7°C of warming, this seems somewhat odd to then say it related to the lower end of the warming band, until you take into account that ECS has been reduced. But then why curtail the range of emissions instead calculating your own? It appears that again the authors are trying to squeeze a result within existing constraints. However, this does not take into account the much higher levels of peak CO2 equivalent concentrations in table 6.3. Peak CO2 concentrations are around 75-95ppm higher than in 2100. Compare this to the green line in the central graph in Millar et. al 2017. This is less than 50ppm higher than in 2100. Further in 2100 Millar et. al 2017 has CO2 levels of around 500ppm as against a mid-point of 410 in AR5. CO2 rising from 290 to 410ppm with ECS = 3.0 produced 1.50°C of warming. CO2 rising from 290 to 410ppm with ECS = 2.0 produced 1.51°C of warming. Further, this does not include the warming impact of other GHGs. To squeeze into the 1.5°C band, the mid-century overshoot in Millar et. al 2017 is much less than in AR5. This might be required in the modeling assumptions due to the very short time assumed in reaching full equilibrium climate response. Are the authors playing games? Like other simple climate models, this lacks an explicit physical link between oceanic heat and carbon uptake. It allows a global feedback between temperature and carbon uptake from the atmosphere, but no direct link with net deforestation. It also treats all forcing agents equally, in the sense that a single set of climate response parameters is used in for all forcing components, despite some evidence of component-specific responses. We do not, however, attempt to calibrate the model directly against observations, using it instead to explore the implications of ranges of uncertainty in emissions, and forcing and response derived directly from the IPCC-AR5, which are derived from multiple lines of evidence and, importantly, do not depend directly on the anomalously cool temperatures observed around 2010. The model does not consider an “explicit physical link between oceanic heat and carbon uptake.” The IPCC estimated that over 90% of heat accumulation since 1970 was in the oceans. If the oceans were to belch out some of this heat at a random point in the future the 1.5°C limit will be exceeded. No attempt has been made to “calibrate the model directly against observations”. Therefore there is no attempt to properly reconcile beliefs to the real world. The “multiple lines of evidence” in IPCC-AR5 does not include a glaring anomaly that potentially falsifies the theory and therefore any “need” for policy at all. That is the divergence in actual temperatures trends from theory in this century. Assumed that all the warming since 1870 is caused by anthropogenic GHG emissions when there is not even a valid statistical test that confirms even half the warming was from this source. Largely ignored any hidden heat or other long-term response to rises in GHGs. Ignored the divergence between model predictions and actual temperature anomalies since around the turn of the century. This has two consequences. First, the evidence appears to strongly contradict the belief that humans are a major source of global warming and by implication dangerous climate change. Second, if it does not contradict the theory, suggests the amount of warming in the pipeline consequential on human GHG emissions has massively increased. Thus the 1.5°C warming could be breached anyway. Made ECS as low as possible in the long-standing 1.5°C to 4.5°C range. Even assuming ECS is at the mid-point of the range for policy (as the IPCC has done in all its reports) means that warming will breach the 1.5°C level without any further emissions. The authors live in their closed academic world of models and shared beliefs. Yet the paper is being used for the continued support of mitigation policy that is both failing to get anywhere close to achieving the objectives and is massively net harmful in any countries that apply it, whether financially or politically. Update 25/09/17 to improve formatting. Donald Trump’s famous tweet that Global Warming is a Chinese Hoax is false, but the policy implications are correct. Total proposed climate policies under the Paris Agreement will not stop global emissions rising, but the policy aim is to have global emissions falling rapidly after 2020. The Rio Declaration 1992 exempted developing countries from a primary obligation to constrain, let alone reduce, emissions. By 2012 the exempted countries accounted for 64% of global emissions and over 100% of the global emissions growth since 1990. The exempted, countries will collectively have emissions rising for decades to come. The most efficient policy is a carbon tax, applied globally. But even this is highly inefficient, only working by making fossil fuel use unaffordable to all but the very rich. That is morally unacceptable in developed countries, whilst would stop developing countries developing, likely leading to civil wars. Actual climate mitigation policies are less efficient and more costly than a carbon tax. Pursuing mitigation policies in just the developed countries harms the poor disproportionately and harms manufacturing. Such policies may not even reduce global emissions. Even if catastrophic global warming is true, the policy reality is the same as if it were a hoax. In either case they are net harmful to the policy countries. Like with utterly ineffective drugs that harm the patient, the rational response to climate mitigation policies is to ban them. I believe that statement to be totally false. The Chinese had nothing (or essentially nothing) to do with the climate alarmism that the Western intelligentsia (especially in the Anglosphere) seem to religiously accept as a series of a priori truths. But the policy implications of believing such a false position are pretty much the same for a policy-maker that (a) accepts as truth catastrophic global warming hypothesis, (b) puts their country first (but still values highly people in other countries, with an emphasis on the poor and the oppressed) (c) but understands the realities of global policy-making, along with the full economic impact of mitigation policy. The hypothesis is the basic form is that global human greenhouse gas emissions (mostly CO2) are resulting in rising greenhouse gas levels. This is forecast to cause large increases in global average temperatures, which in turn, many believe, will be catastrophic to the climate system. The major policy is to reduce the global greenhouse gas emissions to near zero. The UNIPCC AR5 Synthesis Report, Summary for Policymakers 2014 tried to the maths very simple. They only looked at CO2 for the ballpark figures. Using the central assumption of a doubling of CO2 gives 3 degrees of warming, then 2 degrees comes when CO2 levels hit 450ppm. At end of 2016 it levels were about 404ppm, and rising at over 2ppm per year. Only is some warming from other greenhouse gases, so we are well beyond the 420ppm. That gives maybe 15 years tops. Somehow though figures seem to have been stretched a bit to give more time, something I will look at in a later post. The UNFCCC – the body that brings all the countries together to cut emissions to save the planet – had an all-out bash at COP21 Paris in December 2015. In the lead-up all countries (excluding the EU countries, who let the masters in Brussels take the lead) made submissions on how they would contribute towards saving the world, or at least make a start up to 2030. Many were so vague, it was difficult to decipher the “ambition”. This was done to appear like the countries were doing something substantial, when in fact the proposals were often so insubstantial, that targets could be achieved by doing nothing at all. 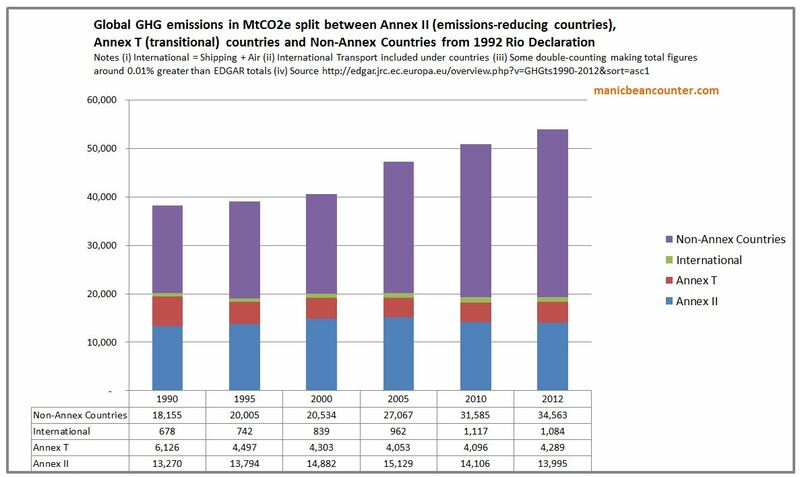 The UNFCCC put all the INDC submissions together on a global emissions graph. The graph is very simple. 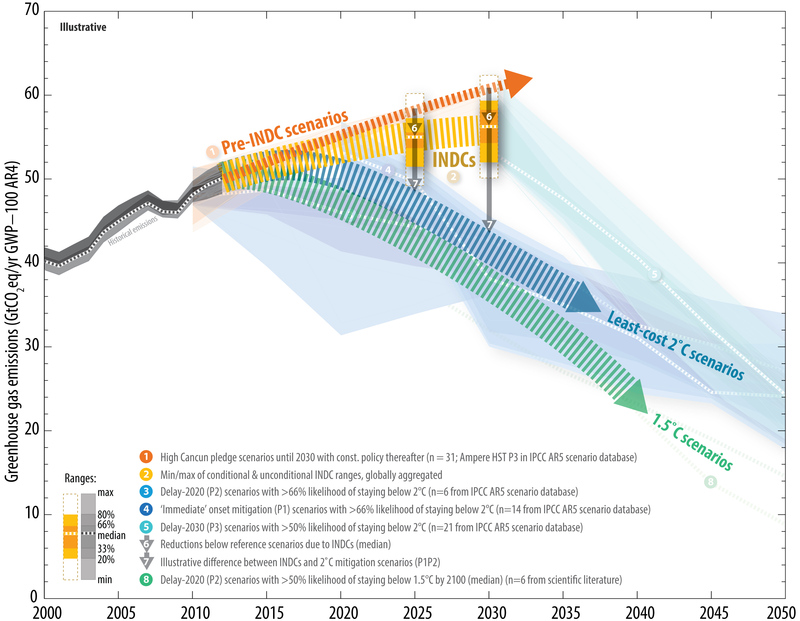 Before the INDCs, emissions were forecast to follow the thin dark orange arrow. With the INDCs, the thick light orange forecast is still tracking upwards in 2030. The least-cost 2C scenarios is the blue arrow. This is going down by 2020, and by 2030 is substantially lower than today. The graph gives a very clear message – the whole exercise is pretty much an expensive waste of time. 40,000 people attended the meeting at Le Bourget airport North of Paris, including the vast majority of World Leaders. Rather than be honest, they went through the usual format with a breakthrough at five past midnight. Then they sent the “experts” away to think up yet more scary scenarios to get better proposals in the future. If they actually read the 1992 Rio Declaration, like Robin Guenier did in October 2015, they would have found out why. In particular Guenier draws attention to this statement in the declaration. These non-Annex 1 developing countries have had phenomenal economic growth, with driven by rapid development of cheap energy from fossil fuels. Guenier quotes some CO2 emissions figures. Instead, I have used the broader estimates of greenhouse gas emissions from the European Commissions’ EDGAR database, grouping the figures into the Annex I countries (the rich OECD countries, like the USA, Japan, European Union, Canada, Australia etc. ); the Annex I Transitional economies (basically the ex-Soviet bloc in Europe); International air and shipping; and the Non-Annex, rest of the world. The figures are quite clear. 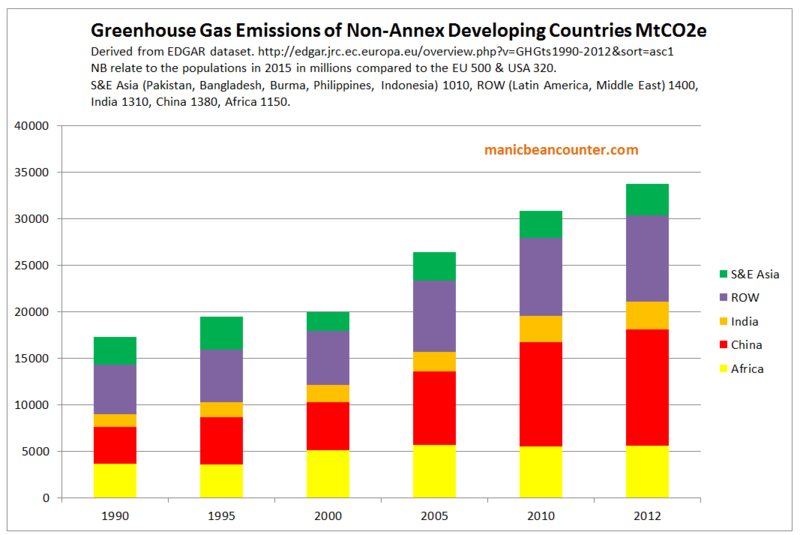 The growth in emissions in 22 years was greater in the Non-Annex developing countries than the world as a whole. But this is just the developing countries starting to catch up. The breakdown of the Non-Annex developing county emissions is below. This “developing” part of the world now has 84% of the global population, but in 2012 was just 64% of the greenhouse gas emissions. India and China each have more than 4 times the population of the USA, Africa 3.5 times and S&E Asia 3 times. Whilst in China emissions growth will peak soon, in India emissions growth is only recently taken off. In S&E Asia and Africa emissions growth has yet to really take off. No matter what the USA and a few other developed countries do, it will not make a big difference to the long-term outlook for GHG emissions. Now compare the global emissions to the UNFCCC graph of INDCs of the target emissions reductions for 2030. The UNFCCC scale is in billions of tonnes, whilst the scale I use is in millions. The least cost 2C scenario is lower in 2040 that the total non-Annex countries in 2012. Even without emissions growth in the non-Annex countries, the Annex countries could cut emissions by 100% and still the 2C limit will be breached by the 84% who live in countries with no obligation to cut their emissions. But maybe the USA should cut emissions anyway? After all it will not cost much, so these developing nations will be brought into line. I only recently realized how wrong this view was. Economics Prof Richard Tol it one of the World’s leading climate economists, who (unlike me) happens to believe in the moral case for cutting greenhouse gas emissions. In a recent paper, “The Structure of the Climate Debate”, Tol explained how a global carbon tax was theoretically the most efficient means to reduce global greenhouse gas emissions. Use regulation, or rationing, or subsidies of renewables, and it will be more expensive – less bang for your bucks. However, I objected. He seemed to be saying that the carbon tax necessary to cut global emissions worked out at less than the taxation on gasoline in Britain. At over $3 (a level that is similar in much of Europe) there are still quite high levels of fuel usage. I can still remember my high school economics teacher, in teaching about elasticity of demand, said that a good example of inelastic demand were the “sin” taxes on booze, alcohol, tobacco and petrol (gasoline). You could have quite high taxes without impacting on demand. Well, after a few exchanges at cliscep blog turns out Tol (in the more technical Tol 2013 paper) was recommending a $210 tCO2 tax to be imposed in 2020 globally, plus an escalator of 5.5% a year forever. It would eventually make fossil-fuelled energy use unaffordable to all but the Hollywood A-listers. I showed British readers in GBP would that would mean, but for the US readers $210tCO2 is about $1.83 per gallon of gasoline. There would be uproar if it was introduced, and people might get more fuel efficient cars. With the escalator that would rise to over $3 a gallon in 2030, $9 2050, $35 in 2075 and$132 a gallon in 2100. There would also be similar hikes in electricity from coal and gas. This might not be fast enough to achieve the reductions required by the UNFCCC, but would not be sustainable in a country with democratic elections every few years. The carbon tax might be harmful to the poor and middle classes in America, but think of what it would do to the living standards of the poorest half of the world. Countries where parents are hoping that their children might enjoy cheap energy for cooking, lighting or heating, would see those hopes dashed. For billions of people their children or grandchildren would never have a family car, or be able to travel by plane. If the Governments of India, China or Indonesia tried to impose such high and escalating taxes there could be economic collapse similar to that of Greece, and likely civil wars. Should the Rich countries still do something? So maybe the United States, and other rich countries, should still adopt policies regardless. After all, they should pay for the (alleged) harms that are leading to disaster. But if the proposers had any understanding of the real world, they would know that just as economic growth has been propelled by abundant supplies of cheap, available and reliable energy. In international trade what is “cheap” is a relative concept. In the nineteenth century steam power was very expensive compared to electricity today. But at this point in time, when developing countries are make power more available and driving their unit energy costs down. Steam power was much cheaper, and more available than water power, which in turn was cheaper than human or animal power. Yet implementing emissions reduction policies, the rich countries are driving those unit energy costs up just as developing countries have been driving unit energy costs down and making power more available. The USA and EU countries are generating a comparative disadvantage. But, as the developed nations tend to be more energy efficient, the net effect on global emissions may be to increase them, despite the policy countries decreasing theirs. That net effect is unlikely to be as large as any actual savings in the policy countries. What is more, the costs of policy will fall on the poor, and those areas of employment with high energy usage and that compete internationally. An argument for climate mitigation is that it is to make small sacrifices now to save future generations from the much larger costs of future catastrophic climate change. That is only true if global emissions are cut significantly, at a cost lower than the actual harmful impacts that would have occurred without policy. As policy to cut emissions will makes very little difference to global emissions, then the sacrifices could be of a small benefit in non-policy countries, but be to the net disadvantage of future generations in the policy countries. The biggest burden of the costs of policy will fall on the poorer sections of society and manufacturing in the policy countries. If the medical profession insisted on patients taking drugs that did not work and had harmful side effects, then in litigious America they would be sued for all they had, and likely jailed. But when the climate alarmists, back by the liberal establishment, insist on policy that cannot work and causes substantial harms they are not held to account. Indeed, so pervasive are the beliefs in climate alarmism, it is an act of heresy to even question this false policy. Now the tables are turned. The first thing that should be done with harmful drugs that cannot work is to ban them from sale. For an incoming President, the first thing to do with harmful and useless policies is to rescind them.